Hello my name is Astrid and I guess with my height of 6ft 4in, I am one of the tallest female massage therapist on this planet! I live at the Baltic Coast and I am covering massage treatments for Hamburg, Lübeck, Kiel and bay of Lübeck. Since many years I am working in the Spa-Management and I did educations as Wellness-Practioner for different Massage styles, Ayurveda-Practioner and Beautician/Visagistic. I do classic massages, like full-half body, head and face, neck-back-shoulder, deep-pressure, hand and foot massages. As well I offer Ayurvedic massages known as, Abhyanga (fullbody 90min), Mukabhyanga (head 60min), Padabhyanga (feet 60min), Upanahasveda (back 60min). I do Shiatsu (90min), Detox-Scrubs with massage gloves. I am fascinated of the world of Wellness/Spa/Health and love to work with different cultures, training staff, writing Spa-Menus, set up new-openings for Spa`s. At the moment I am Supervisor in one of the most beautiful Thai-Day Spas of Europe. Before I entered the Spa business I was working in Gastronomy and Hospitality in different countries and parts of Germany. Next to my casual jobs I loved the modelling and did that specially for Tall woman section as leg/hand model in the US and UK. So far, the facts about me. I would love to get booked by you, to provide you with my credo for a soothing, rejuvenation break. EnJOY! Hi, I’m Sonja and I have lived in Michigan my entire life and have been blessed with my esteemed husband Scott and 7 beautiful children. I have been involved in the health and beauty industry, in some capacity, in and around the Grand Rapids area since 1982. I worked 24 years in relaxation massage and as a Cosmetologist, and this year completed my Medical Massage and Manual Therapy Certification through Blue Heron Academy of Healing Arts & Sciences. Medical massage is very deep and effective in producing the bodies normal mechano receptors which promote tissue and joint health. It is also very important to stretch the muscles and maintain elasticity in the tissue. One of my main goals, as a health facilitator, is to help enable the body to continue in its optimal mobility and performance. I have experience in: Gua Sha/chaffing treatments with Chinese linaments, hot & cold stone therapy, Thermaphore with casteroil pacs, cold compresses, PEMF – Pulse Electro Magnetic Field, Bioptron & infrared treatment, bony lever joint physics techniques, Isometric stretches. Let’s move forward, I am excited to serve and support your health and assist you in your healing process. Hello, my name is Amber and I have lived in the Pacific Northwest for 13 years. I'm one of the many transplants from the east coast that now reside in Seattle. I'm nationally certified in massage and acupuncture, and have been running my own natural healing practice for four years now. Hello, my name is Erin. 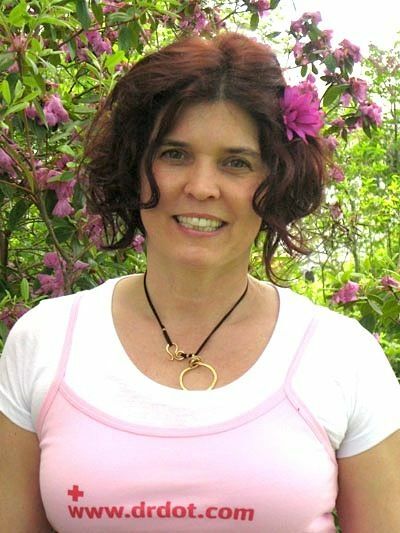 I have always had a passion for helping others which led to getting my massage therapist license in 2004 and my 200 hour yoga teacher certification in 2008. My practice is founded on the idea of conscious touch, a deep awareness that each touch we make can have a profound effect on not only the physical body but also on the soul. As old as time is the idea that self awareness can lead to a higher path in this life and a better understanding of our true needs. Through bodywork one can cultivate awareness and start to take the first steps in achieving this goal. By catering to your needs be it relaxation, restoration, or even deep therapeutic release, I can take you out of the everyday chaos and help facilitate the healing process towards a calm and balanced life. Whether on the table or on the mat, I am able to cater to each individual’s needs in helping them to achieve personal wellness and enhanced inner happiness. Contact Dr. Dot to schedule my services next time you are in Maine! Hi, I'm Mary, I live in Dallas, where I was born and raised. When I was little my grandmother always told me I should be a massage therapist, so eventually, after earning my associates degree and having two beautiful girls, I realized she was right. I have been a licensed massage therapist for about 6 years and I am lucky, I truly enjoy and have a passion for my work. The list of my skills and modalities is long and boring, of course they include Swedish, Deep tissue, and hot stone. Basically, I am a people orientated therapist and every massage is tailor-made based upon your needs. I am also CPR and first aid certified, just in case. This opportunity to work for Dr. Dot is awesome! I look forward to meeting you. 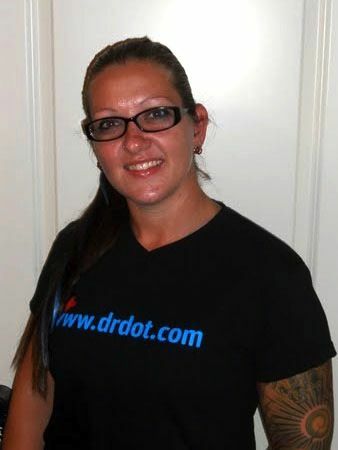 Hi, I’m Dr. Nicole and I have been practicing chiropractic in since 1997. I am originally from New York but moved to Florida in 1997 when I graduated from Life College in Atlanta. Chiropractic completely changed my life in all ways; physically, emotionally and even spiritually. It allowed my body to function properly again and as a result, I healed from serious illness and I became completely medication free. My transformation from a mechanistic view point to a vitalistic one then grew this enormous passion for chiropractic and in helping others heal naturally, from above-down, inside-out. I love adjusting people of all ages including athletes, pregnant women (certified in Webster Technique), newborns, infants and children, to get them out of a health crisis and then to keep them healthy, well and full of vitality. I prefer to use my hands to adjust the spine and release that incredible restorative power inside of you that heals. My other passion is in empowering others to let go of their fear and to rely on their own body’s ability to heal, regenerate and repair rather than depending on chemical medications that always cause side effects. Chiropractic is not a treatment but a lifestyle, a way to maintain your health and my goal is to educate, adjust and enlighten as many people as possible to achieve optimal health through natural chiropractic care. You will be in excellent hands with me! 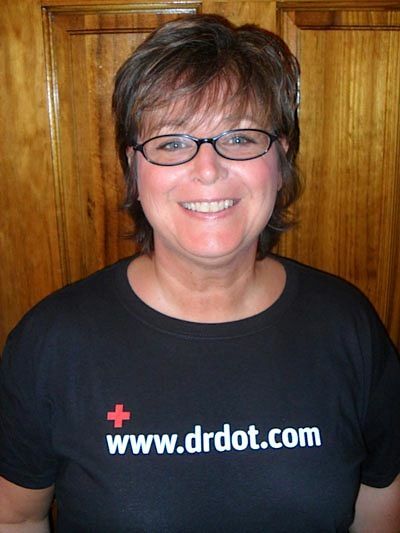 My name is Sarah, and I am delighted to be part of Dr. 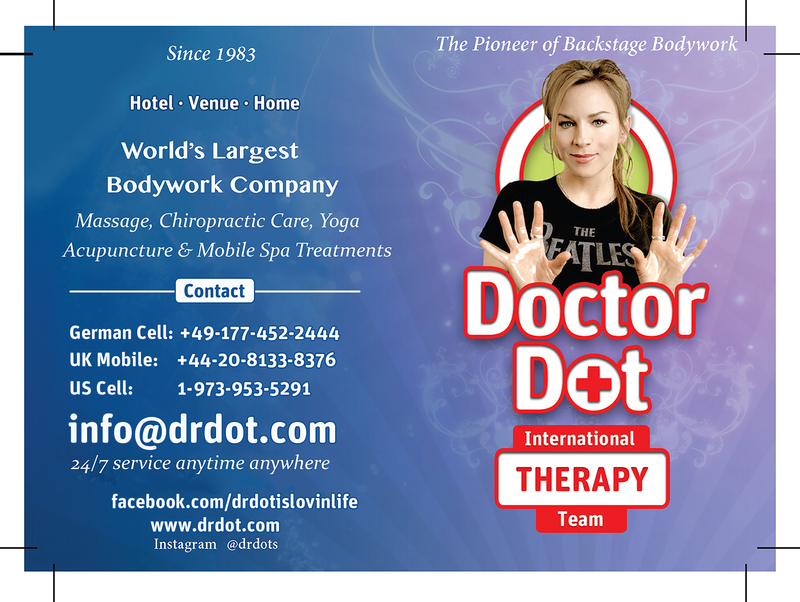 Dot's amazing team consisting of the best masseurs worldwide. I come to you from the Mile High city in colorful Colorado. I began my massage career here, obtaining my Associates of Occupational Studies degree from the 'Boulder College of Massage Therapy,' in Boulder Colorado. Massage to me is all encompassing. It opens us up to many of the wonderful possibilities of life, and is a therapy for the Mind and Soul, just as much as the Body. Massage has been a passion of mine from the start; and I am able to continuously grow as a therapist and person, because of this amazing field and the wonderful people I have met thus far. Five years in and I am yearning for more. So What is my specialty? Outstanding massage of course! I provide an outstanding massage, using various modalities and techniques, tailored towards each clients' specific needs. Just ask and I shall provide. Hi my Lucy and I live in Birmingham UK. When I finished school I worked in Accounts and IT, I did this for a good few years but always craved more and wanted a bit more excitement. My first leap into the therapy world was with Indian Head Massage and loved doing it so much that I became addicted to massage. I have since gone on to do many therapies and different styles of massage which include: Holistic massage, Swedish massage, Deep Tissue massage, Sports massage, Manual Lymphatic Drainage massage, Aromatherapy massage, Reflexology, Hot Stone Massage, Cold Stone Massage, Aroma stone massage, Aroma sport massage, Tibetan Head Massage, On-Site Massage, Pregnancy Massage, massage in Labour, Post Pregnancy Massage. Apart from all the different types of massage that I do I also do: Thermal Auricular Therapy, Body Brushing & Exfoliation, Nutritional Advice, Lash & Brow Tinting, Manicures, Pedicures, Facials, Body Treatments, Waxing, Eyelash Extensions LVL Lashes, Eyelash Perming, Nail Extensions, Skin Peels, Spray Tanning, Lotion Application Tanning, Treatment and management of Injuries. I also do Make-Up:- classic, Special Occasion, Bridal, Media, Special Effects and camouflage. I also do designer Bikini Waxing. I am also qualified and insured in using the following products: Glo Minerals, Jane Iredale, Creative Nail Design, Agera Skincare, Karin Herzog Skincare, Nouveau Lashes, Nouveau LVL lashes, MiniKini Bikini Line colour, GiGi Colour Down Under, GiGi wax, PHD wax, Forest Floor wax, Harley wax and Clean & Easy wax. I am a registered therapist with FHT and The Guild and am fully insured with Salons Gold. I am frequently told that I give the crème de la crème of massages and that I have magic hands. My massage is unique in that I use everything that I have learned and put them together to tailor each massage to each individuals needs. I love doing what I do now and what makes it even better is that I can combine two passions together which is massage and music, now I can say that I get the excitement and satisfaction that was missing before. 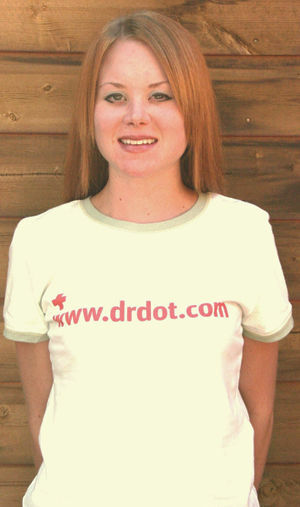 Available 24/7 & tours if required I first saw Dr Dot on GMTV (Good Morning TV – UK version of Good Morning America), where she was massaging a man with her teeth. This image has stayed with me, as it was nothing that I have ever seen before. Then whilst surfing the web I came across her website and instantly remembered her as the woman that massages with her teeth. I wasted no time in e-mailing her and couldn’t believe it when she replied. She sent me to see Roddy in Reading who thought that my massage was awesome. I am now part of the UK team and feel privileged to be able to represent a remarkable woman. If you want to book me for an amazing massage or a great waxing, email me at info@drdot.com and put "Lucy/Birmingham" in the subject line.